These blanks from Prvi Partizan are produced to the military M200 specification and work well for training and demonstration purposes where sound and fire are desired but actual bullets being fired are not. They can also be used to trigger devices such as grappling hook launchers. This economical 2,000 round case is perfect for reenactments, film productions, salutes, and other high volume applications. This ammunition is loaded in Uzice, Serbia and uses non-corrosive Boxer primers. 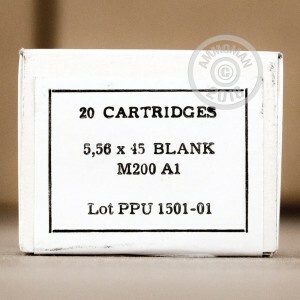 Semi-automatic firearms may require a blank firing adapter to cycle with these cartridges. Buy this case or any other items totaling over $99 and get free shipping from AmmoMan.com!